Home CM CELL Computer Teachers Vacancy Regard – CM CELL Reply!!! Computer Teachers Vacancy Regard – CM CELL Reply!!! It is learnt that a case has been filed before Hon’ble Madras High Court with a request to issue direction to School Edn Dept to fill up the 750 vacant posts of Computer Instructors in Govt Hr. Sec. 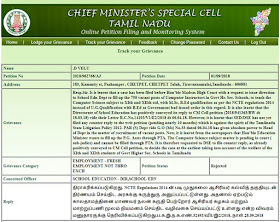 Schools, to teach the Computer Science subject to XIth and XIIth std, with M.Sc, B.Ed qualification as per the NCTE regulations 2014 instead of U.G.Qualification with B.Ed as Government had issued order in this regard. It is also learnt that the Directorate of School Education has positively conveyed its reply to CM Cell petition (2018/941363/BW dt 18.03.18) vide their Letter R.C.No.14193/V1/E2/2018 dt 06.04.18. Previous articleஉதவி பேராசிரியர் பணி : TRB தேர்வு தேதி அறிவிப்பு!!! Next articlePre Metric Scholarship Date Extended till 15th October.!! !